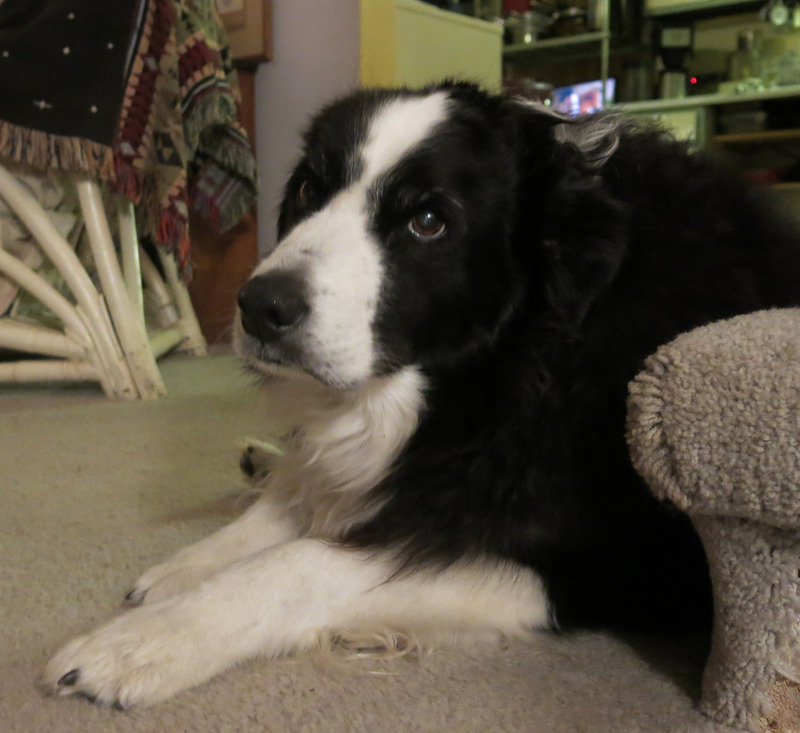 Greetings and salutations, everyone; yes, once again it is I, Chess the purebred border collie, filling in for the guy I live with, and here to bring you some moderately exciting news from our garden. You may remember me from such posts as “The Nuts Be Brown” and “No Pain, No Gain”, among so many, many others. Here I am in a characteristic, though rather sullen, pose. If I look sullen and resentful, it’s because I kind of am. As I said before, the guy I live with was careless and let me taste one of my pills, which was so bitter it was bitter, and now I’m not eating anything until the coast is clear. He talked to my doctor who said this is what we do, and so we just wait it out. The guy I live with said it wasn’t like I didn’t have reserves of fat to rely on, which was pretty darn rude if you ask me. But my walks have been excellent, way more so than, say, last week, and he let me sleep in this morning, not that our schedule is that full anyway, but it was nice to be under the covers and have chilly air blowing in, and to be able to get up when I felt like it, instead of hearing the stupid alarm telling me to get up when I didn’t want to. Well, so, we haven’t been doing anything interesting. The guy I live with, who, as you may recall, claimed that he had raked up “the last of the pods”, raked up more, yesterday. He says they’re generating spontaneously now. And almost all the little seedlings in the seed frames have been planted. It started out cool today, and then rained some, and then the sun came out, and then it rained again (he had to push me out of the house to go on my afternoon walk because I was certain it would thunder, but it didn’t), so I guess the tiny plants went into their allotted places very happily. 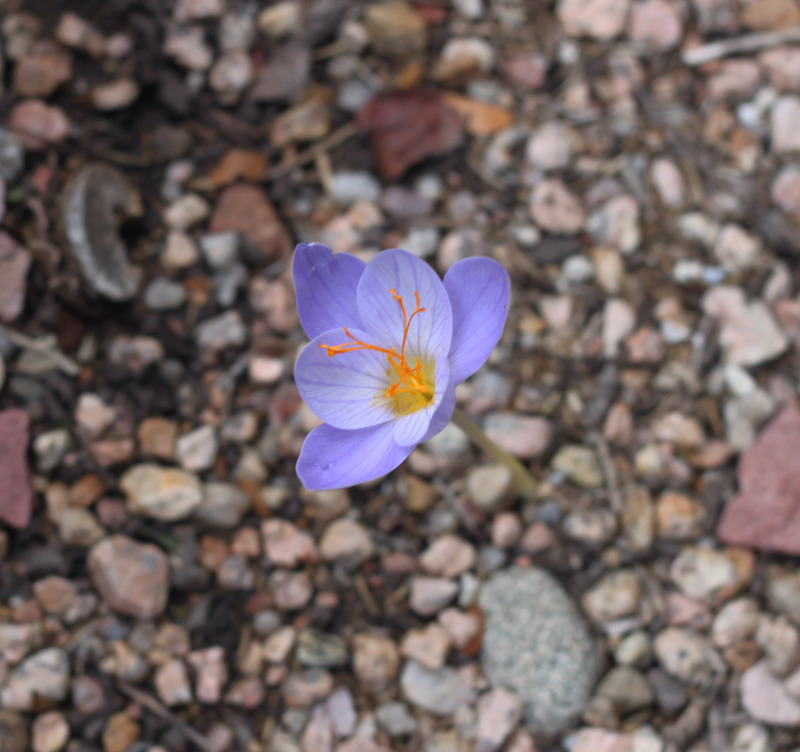 There’s not much to this post, in fact, but the guy I live with thought it would be fascinating to show a picture of the path crocus that magically appeared the other day. That’s right, there was a crocus flowering in the path. That was the excitement. Here are some more, flowering in a patch of Malva zebrina. They’re all over the place, but especially in my mommy’s little garden. Ants carry the seeds wherever they go. There are lots of crocuses flowering now (though, if you asked the guy I live with, not nearly enough). 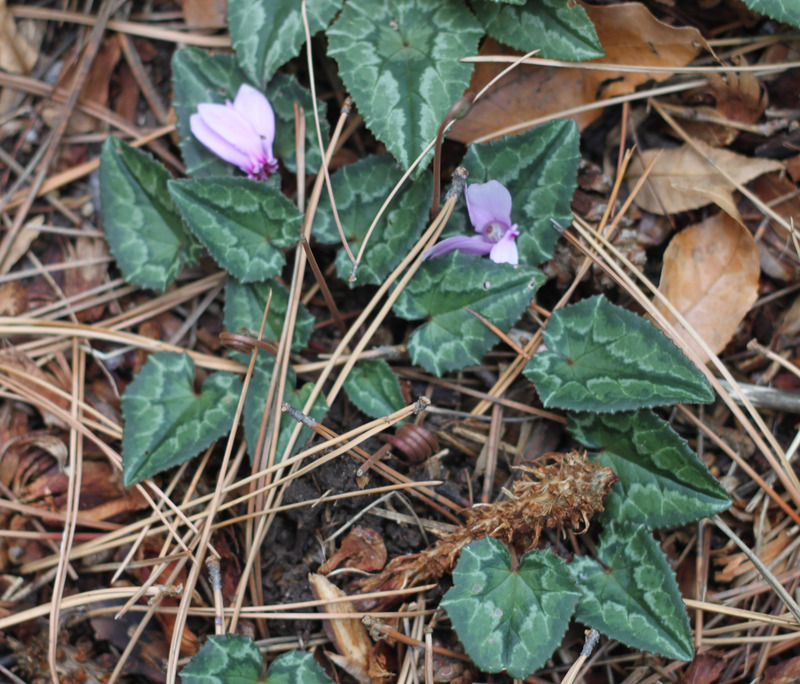 Speaking of ants, the guy I live with cleared a bunch of stuff out of the shade garden, to make room for more Cyclamen hederifolium. They haven’t seeded around as much as he hoped, and he thought maybe the new space would allow ants to carry the seeds there. Or something like that. 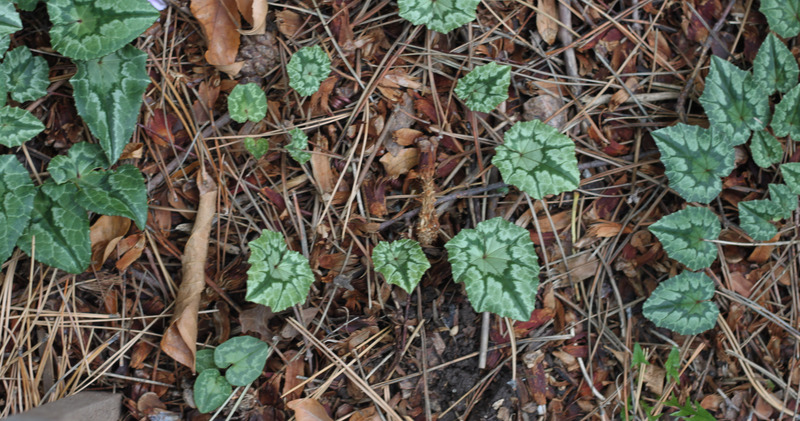 The leaves of the cyclamen are pretty variable. The guy I live with obsesses on them a lot. He said this one was ‘Fairy Wings’ a while back, but it’s really ‘Arrow Leaf Select’. This is ‘Fairy Wings’. These are just regular ones. This one is ‘Tile Barn Helena’. I guess this is what we’re going to do, show pictures of crocuses, and cyclamen leaves, over and over again, until it snows. Then the snow will melt, and we’ll show pictures of crocuses, and cyclamen leaves. I’ll leave you with another picture of me, this time not really wanting my picture to be taken, because the flash might have gone off. It didn’t. But you never know. 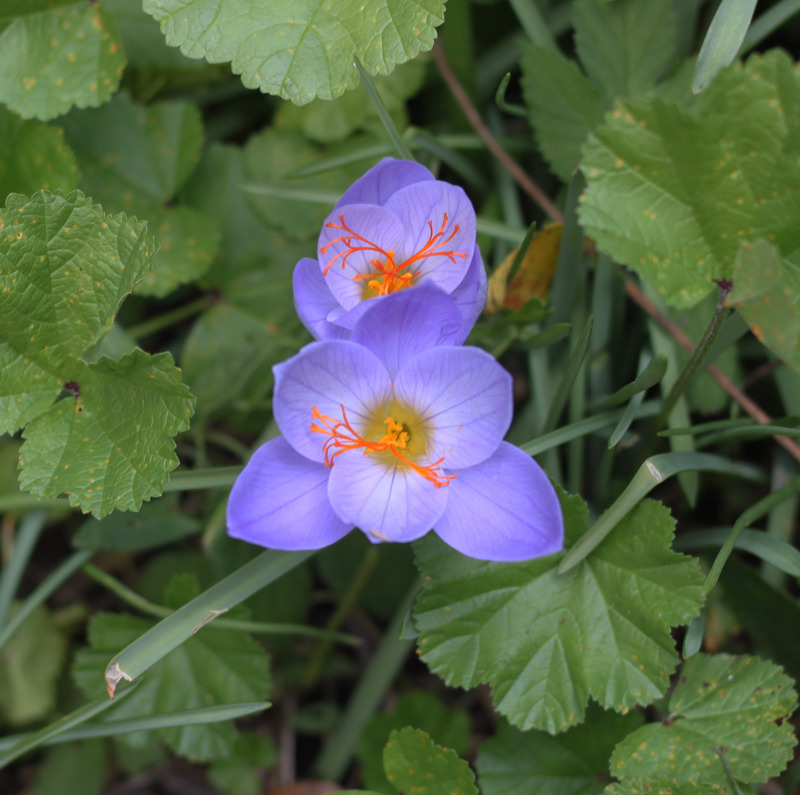 This entry was posted in Uncategorized and tagged Crocus pallasii, Crocus speciosus, cyclamen hederifolium. Bookmark the permalink. Woo, Chess, you really have sullen and resentful *down. * Not without reason, of course. Glad to see you’d mellowed to a more low-key look of long-suffering by the end of your posting. Do pay attention to the guy you live with when he assures you that what he is offering will not be bitter because remorseful people generally tell the truth. Eat a little, Chess. The crocus pallasii is both exquisite and sweet, and I can quite see why all the photos and close-down leaf examination and space-clearing, activities interrupted by snow and continued after melt. I can tell you there would be plenty of excitement in my garden – a bit of dancing, even, perhaps caloo-ing and calay-ing – if a crocus magically appeared in the middle of the path. I intend to go out and examine my paths first thing tomorrow morning. Well, maybe after tea. Soldier on, Chess. If he could take back that inadequately-wrapped bitter pill, the guy you live with would. Thanks; I bet he would, though it’s hard to take back things. I do drink water, and hopefully the guy I live with won’t start thinking about the syringes he’s accumulated (for administering Attapulgite over the years) as a food delivery system. The thing with the crocuses, which are a little late this year (I mean C. speciosus) is that sometimes they appear in droves, or herds, or flocks, and sometimes just pop up here and there up until about Christmas. Then the “spring” ones appear in late January or February. Usually. Ted (the cat) has his pills in liquid which gets squirted into his mouth with a syringe. It makes him quite indignant. I’m feeling a little jealous of those Cyclamen that the guy you live with owns. But if I have to have your type of weather to grow them forget it. That would be worse than a bitter pill. No, there’s a cyclamen nursery (Hansen Nursery, online) in North Bend, Or, so you don’t need to have posterior-freezing weather to grow them. In fact the cold limits what we can grow. I’m a little concerned about syringes and what sort of thing might be going through the guy I live with’s stressed-out mind. Sometimes he doesn’t let on how stressful all this stuff about me has been, but the not-eating business has definitely stressed him out, even after he talked to my doctor. This has been quite a year for us. That’s why all the gardening, I guess. LBefore he resorts to syringes, the guy you live with might remember his rude comment. Plus British prisons and the IRA. I think you can go a few days more without being force-fed, which of course is necessary in some cases. Not yours yet. Advise your guy to calm down. Maybe talk to a soothing vet. Om shanti shanti, tell him that’s a good path for the next few days. Gardening, that’s the ticket. Long Island broccoli might do the trick. Thanks; the guy I live with is generally fairly calm, except when it comes to what he calls my “weird behavior”. He associates me with my mommy, which is one of the reasons why he adores me. Aside from me being intrinsically adorable. Funny thing, I eat my Rimadyl tablets, which the guy I live with says smell like something that expired a week or two ago. They’re really good. 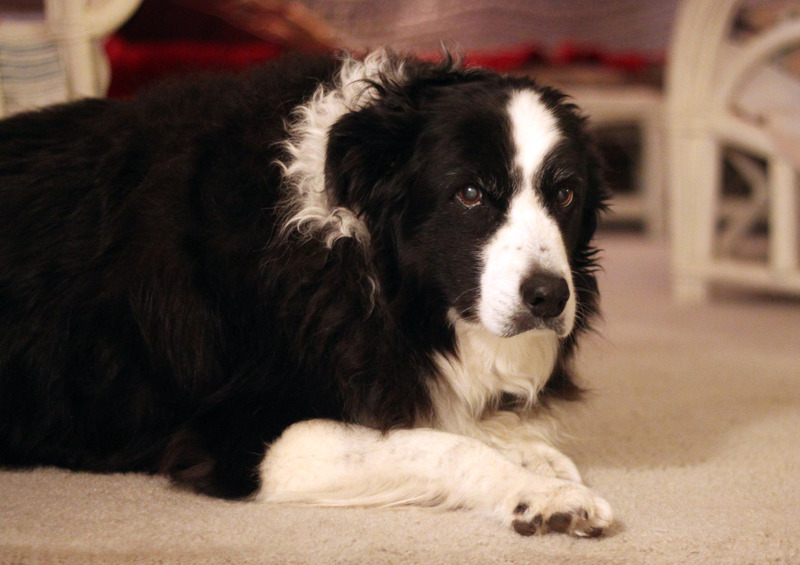 When my buddy Slipper was sick with liver cancer, the guy I live with tried all sorts of gourmet recipes to get him to eat. Our regular food drizzled with sardine juice. Or rice swimming in chicken fat. Or ultra-fatty ground beef topped with cheese. Or hot dogs and hardboiled eggs run through the food processor. I tell you, the guy I live with is some chef. Those were all excellent, and if my buddy Slipper didn’t finish his, I was over there to clean up his plate before the guy I live with could stop me. I enjoy the autumn crocus species but I can’t quite wrap my brain around seeing them in fall instead of spring. Back where I come from (Northeast) the snowy winters were pretty long and the first sight of spring crocus were a very welcome sign that the end of winter was near. That and the first robin! Now that I have been living in the Northwest for a long time, I find that the association is still strong even after all these years. It’s definitely true that associations can remain with us for years. Just ask me about the pain pills I never want to taste again. Crocus, narcissus, snowdrops, cyclamen, and colchicums all have autumn, winter, and spring blooming species. Sometimes, or maybe usually, the ones that bloom in late autumn are wrecked by cold weather or snow. The crocus here are usually done by the end of March. The “spring” ones get shredded by robins, which remain here all winter long, by the way, and that ticks off the guy I live with to no end. Fall-blooming crocuses get in the way of my General Theory of Crocuses. The ones that appear here on the north shore of Long Island in early March are what I see as Late Bloomers (from the previous Summer) and are the totems of the all gorgeous dreams that can come true in the late Winter of life. Those Fall-blooming flowers complicate my cosmology, if that’s the word I want. Chess, in that final picture of you there is a heartbreaking amount of love and wisdom in your eyes, which shows me that you are on the verge of forgiving TGYLW for having anything to do with pill-formed bitterness. I hope you’re having a huge Sunday brunch — pureed hot dogs and hard boiled eggs sounds delicious. Thanks; no, I haven’t eaten anything yet, except my Rimadyl tablet. The guy I live with went to get some pill pockets, duck and pea (flavor, not instructions), which he claims smell horrible, so I might like them. You know how bad pea water can smell when you cook green peas (the guy I live with says preferably with some chopped shallots and butter), well, that’s what these smell like. Yeah, well, the cosmology. The “spring” ones are really the last of the bunch. The autumn- and winter-flowering ones push up leaves, either when they flower, or after, and the leaves sit there all winter. 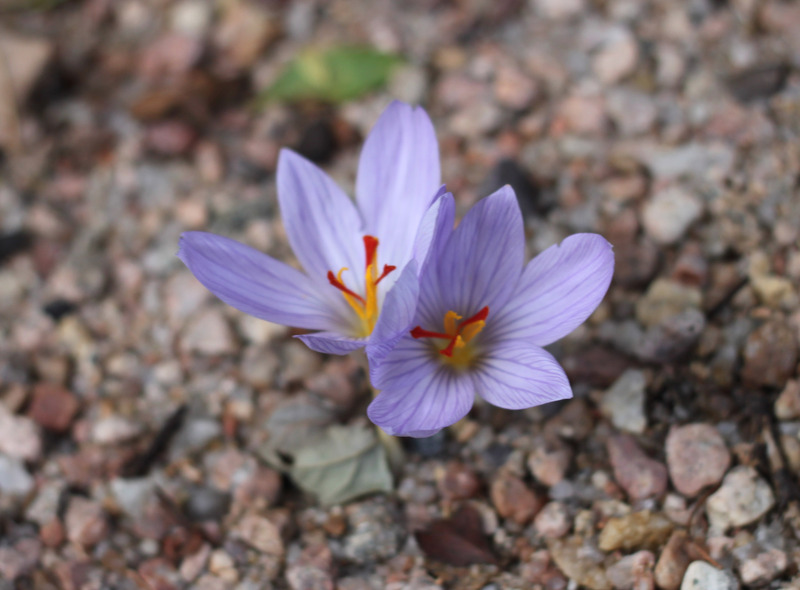 Particularly in the case of the saffron crocus, C. sativus. The presence of green leaves in January seems to completely freak out a lot of people, particularly around here, like Helleborus niger flowering in January. We try to be calmer than that. Or at least I do. 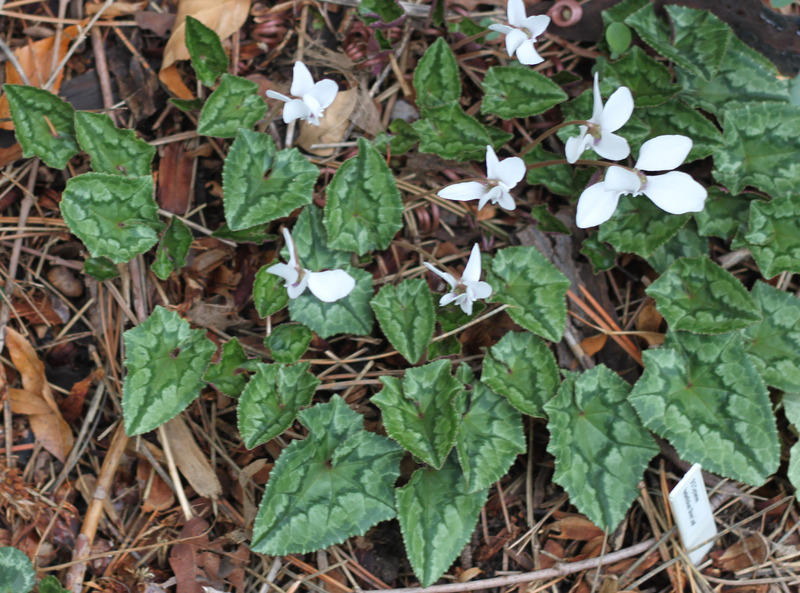 Love those cyclamen with the almost white leaves. They are wonderful. Very hard to come by. One place you can get them is Edgewood Gardens; they publish a list every year. Ten to twelve dollars a tuber is about average for cyclamen. Also Hansen Nursery. 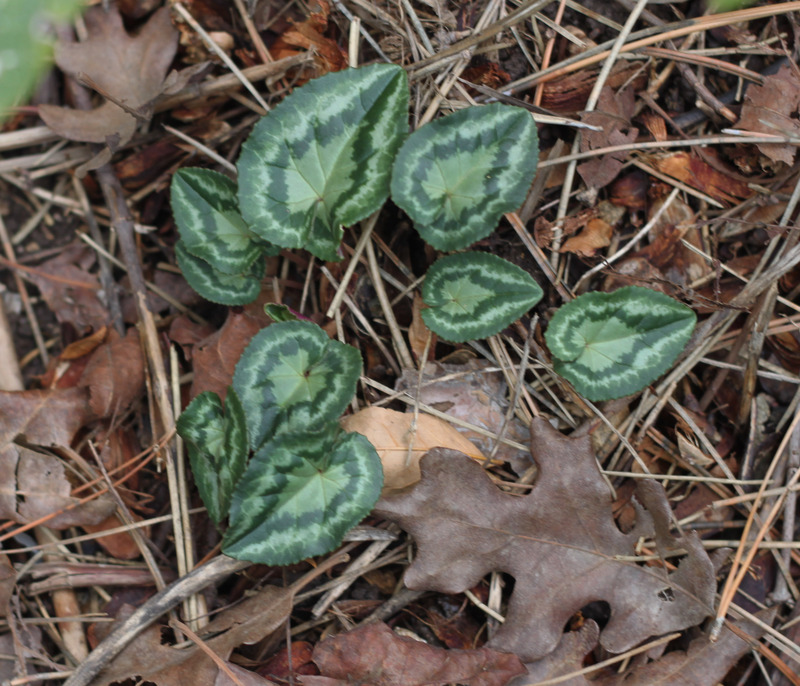 Sometimes, if you have a lot of plants, you get fancy-leafed seedlings, too. If you’re nice to your ants, that is. Didn’t even know such cyclamen existed! There are a lot of selections. Not many hybrids, mostly just selections for leaf pattern, color, etc. 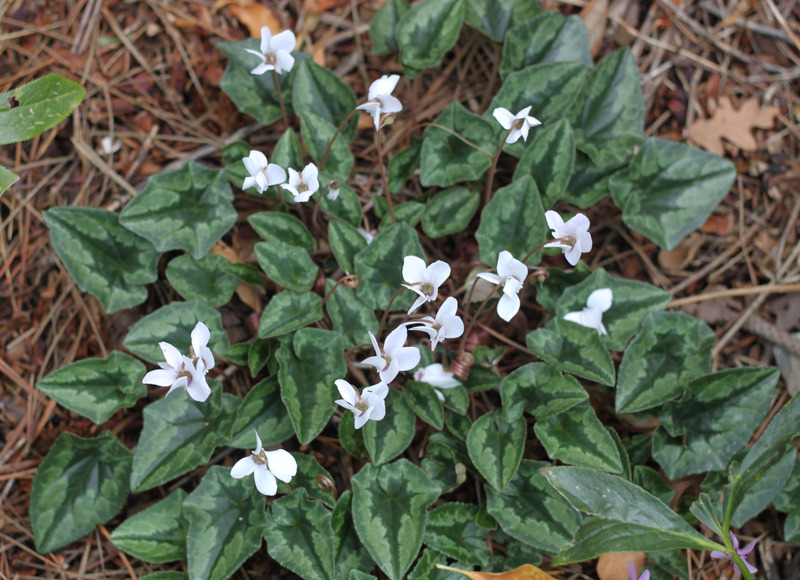 The species hardy in the garden here are Cyclamen coum, hederifolium, cilicium, mirabile, intaminatum, pseudibericum, confusum, purpurascens. Some, like trochopteranthum and libanoticum, haven’t been tried here. 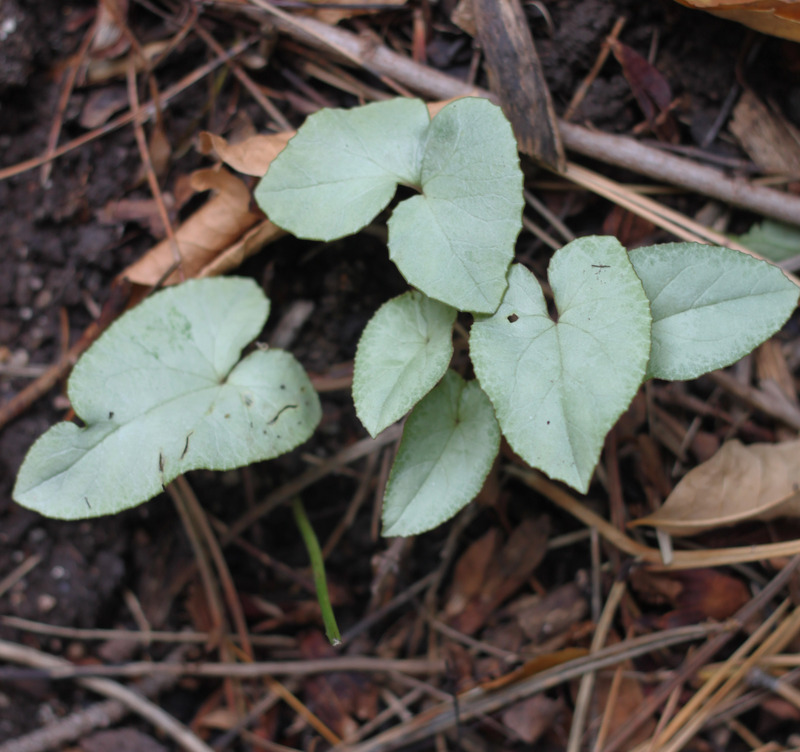 There are hundreds of plants of C. coum, almost all sown by ants. 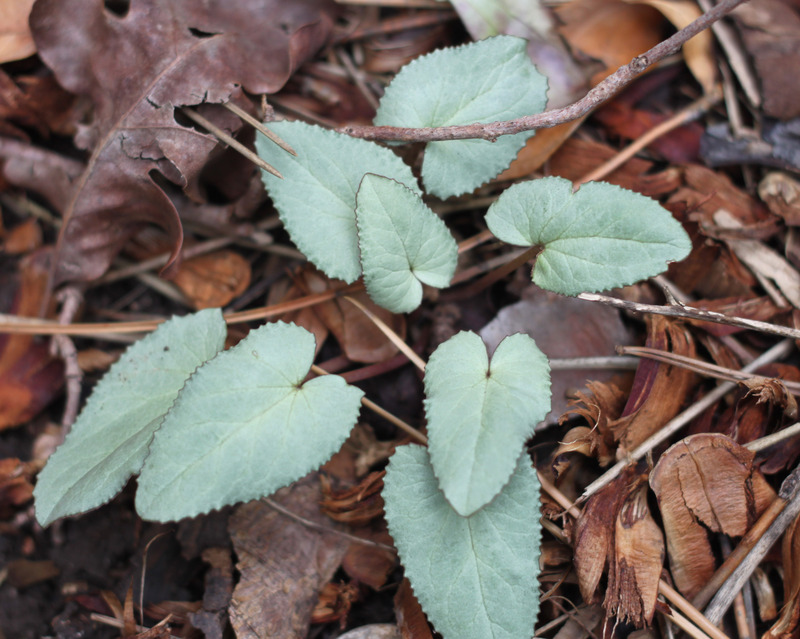 Growing in the shade of the fence of the south side of the yard, in heavy soil. Here, they really need to be planted before September, to make sure they’ve rooted into the soil; ptherwise, they can be grown in pots until next spring, when they can be planted. Can be grown from seed, too. Plant the seed in a pot, cover with a baggie, left open at the top so no rotting, kept moist and in total darkness for about a month, until they germinate.